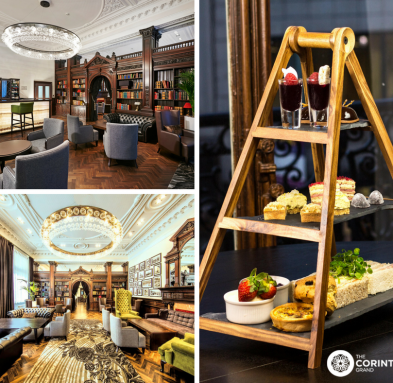 Our beautiful hotel dates back to the 1800s and is steeped in history, so let us take you on a journey through time to discover all you need to know about this fascinating and breathtaking structure. 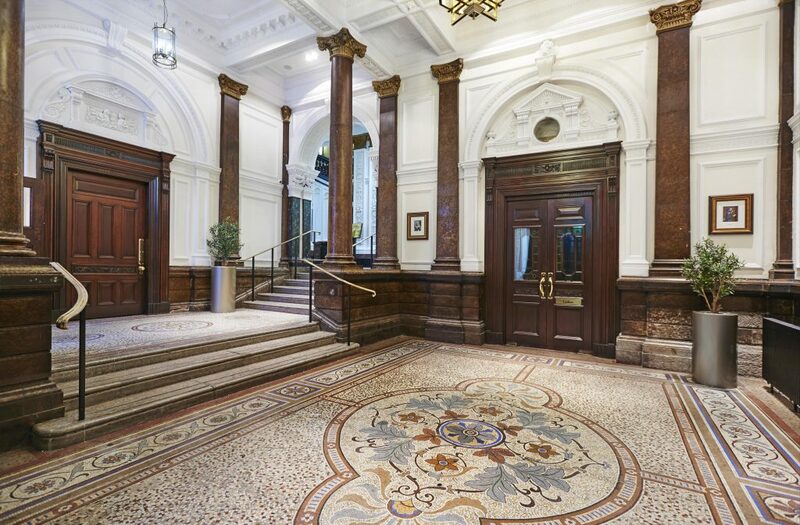 Originally built as a gentleman’s club in the second half of the 19th century this stunning building boasts elegant, sweeping staircases, magnificent high ceilings, Italian mosaic floors and 50 original stained glass windows, which have all been painstakingly restored. 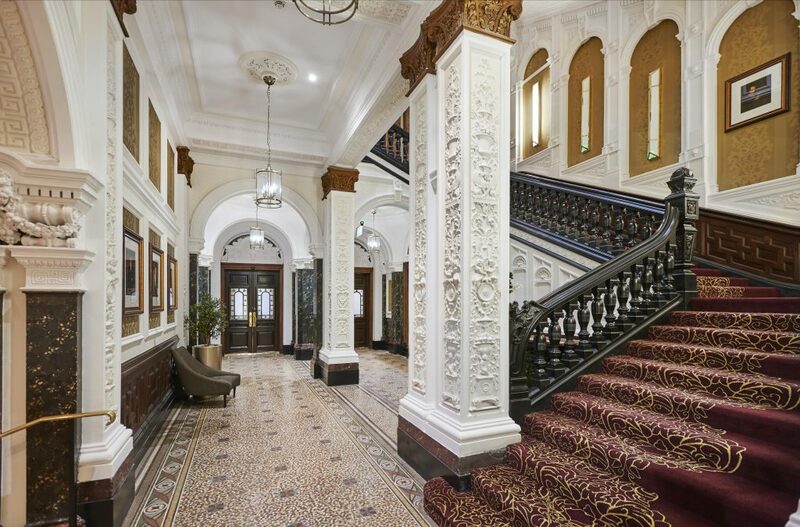 As recently as the 1990s the building was used as an annexe for the city’s Municipal buildings, which stand next door but has now been turned into one of the most desirable hotels in not just Liverpool, but the whole of the north-west. Initial building work began on the building in 1880 with a commemorative cornerstone being laid at the site by the Marquis of Salisbury in April 1882. A number of dignitaries were also present for the ceremony and a huge crowd gathered around the temporary platform as the stone, which was made from polished Pentland marble and inscribed with a few words to commemorate the occasion was lowered into place. Designed and built by Francis Usher Holme and his uncle George Holme of nearby Westminster Chambers on Croshall Street, Liverpool, the building was completed in 1883 at a cost of £40,000 at the time, which equates to around £5 million today. Despite earlier Gothic plans, the property was a highly elaborate affair, spread across four floors and with two wings to the Dale Street facade, which is still as impressive today. Standing proud in the heart of the city this iconic building has performed a number of roles since it first appeared on the corner of Dale Street and Sir Thomas Street. 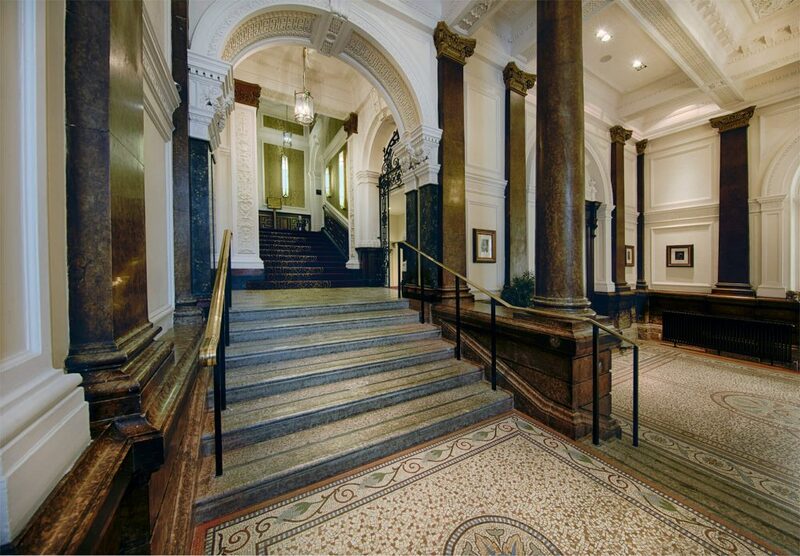 It was originally built as the new home for the Liverpool Conservative Party and its most distinguished members. 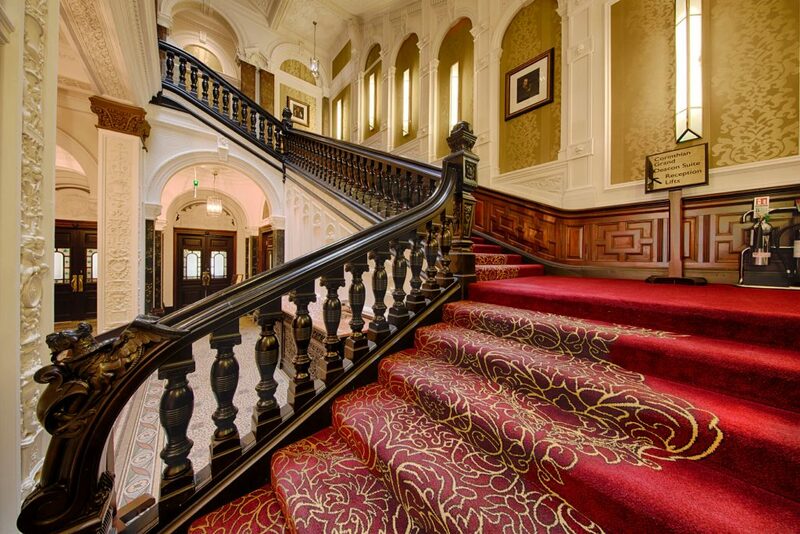 The building provided its wealthy inhabitants with four floors of palatial reception rooms, private dining areas, as well as card and billiard halls, and the elegance of that period is still evident as you enter the building today. During the years spanning the two world wars the building was used for the first time as an annexe to the municipal building just next door for more practical purposes. This was the first time that the building was used as an office of local government but would herald a change in its fortunes for the years that would follow. Thankfully it sustained no major damage during the air raids of the blitz, which caused such devastation to the city between 1940 and 1941. The building was eventually acquired by the City Council in the 1960s, housing workers for its education department; though was also used by a number of prominent local council departments. The building was finally closed for business in the mid-1990s as councillors found it difficult to justify the expense of using a property of such grandeur as a public office. 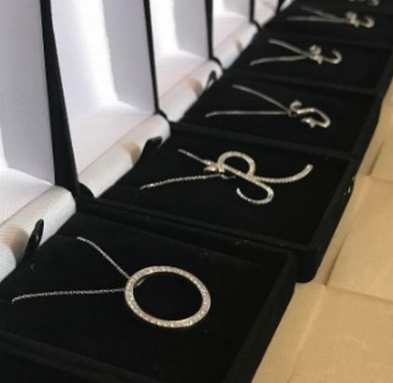 After standing empty for a number of years the building was eventually restored to its former glory after a prolonged period of renovation work was carried out following decades of neglect including the addition of a new section where the reception is now located. In 2016 DoubleTree Hilton Hotel & Spa, Liverpool, opened on the site, offering all the grandeur and opulence that the very first visitors would have experienced almost a century-and-a-half previously; meaning one of the most iconic and eye-catching structures in the city is once again a major focal point that attracts visitors from all over the world. 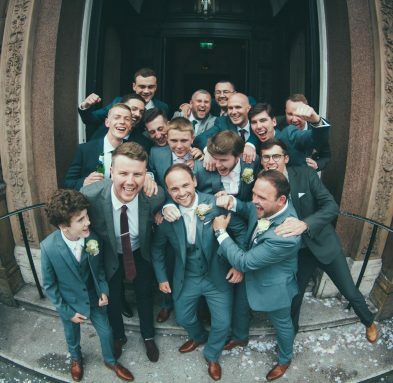 If you want to have your wedding at the magnificent Corinthian Grand or for any further information please contact our friendly team today who will be happy to discuss your every need.